Delicious when eaten fresh, added to salads, used as a garnish or even when added to dishes in larger quantities. Each packet contains approximately 450 seeds. Giant of Italy is an excellent, large Italian Parsley variety with that classic aromatic, mildly pungent yet sweet parsley flavour. Great as a garnish, salad herb, or just eating fresh straight from the garden. This variety is one of the best for cooking and retains it's flavour and shape better than curly-leafed varieties, in fact it can even be used in larger quantities as a green vegetable in dishes (I like to add it to curries). 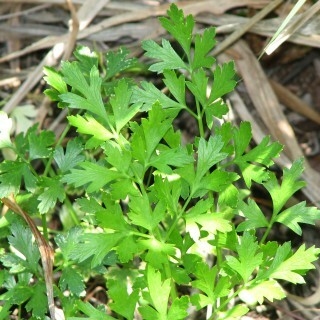 This variety is also good for drying and crushing into parsley flakes. The seeds can also be collected and used as a spice. Parsley is a rich source of folate, vitamin A, vitamin C, vitamin K and iron. In areas that don't get too cold during Winter parsley can be left in the ground and grown as a biennial, it'll die back during Winter but will re-shoot from its underground root system in Spring. Leaves collected from second-year plants will be more bitter than those from first-year plants and will die after flowering. Sometimes plants will bloom and produce seed in their first year, especially in warmer climates. Will self-sow year after year if conditions are right. Parsley is a heavy feeder and prefers a rich soil full of compost or well rotted manure. If you live in a hot climate parsley will benefit from being planted in a spot that is shaded part of the day, ideally from the hot midday or afternoon sun. In the tropics parsley should be sown from April to July to avoid the wet season when it can be prone to rot and other fungal diseases. In the subtropics the best time for sowing is from February to May. In temperate regions sow anytime between September and May for best results. In cold regions sow from October to April. Sow Parsley seeds Parsley seeds should be direct sown whenever possible as they don't like being transplanted, sowing into small, individual pots is preferable to sowing into communal seedling trays. Sow seed 4mm deep, cover with mix and firm down to prevent the seeds from drying out. When planting out or thinning seedlings sown directly, 30cm should be left between plants to allow them room to grow. Germination of parsley seeds can be quite variable, generally taking between 14 and 28 days. Parsley can be harvested as soon as it's big enough that it won't mind loosing a few leaves, about 12 weeks before a decent harvest can be had. Picking leaves encourages new growth, remove flower heads as they form to prolong leaf production. When harvesting parsley leaves be sure to remove the entire leaf stalk, leaving too many of the stalks tends to cause the plant to bolt to seed instead of producing more leaves.